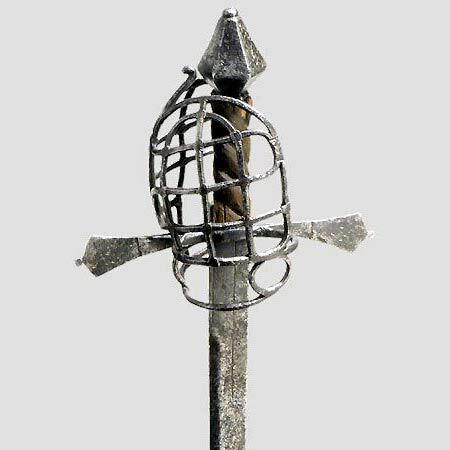 It was during the Renaissance period that the sword started to develop more complex forms of protection for the hand. 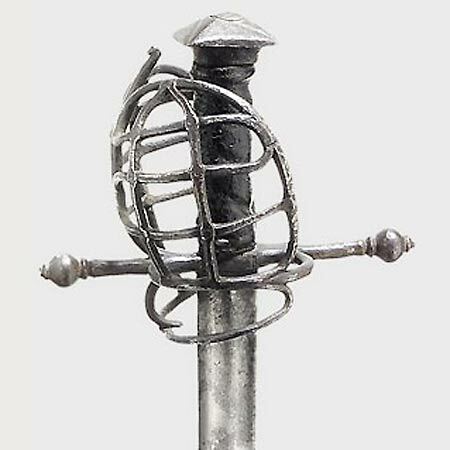 Starting with the finger ring and ricasso, the hilt was augmented by various counter-guards and a knuckle-bow, which was formed either by the front quillon or by a separate bar rising out of the arm and curving up towards the pommel. 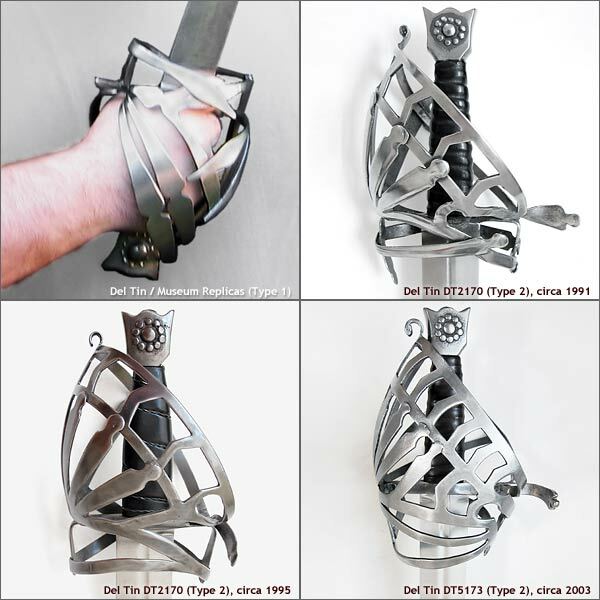 It was this evolution that created the complex basket-like development of the sword hilt, reaching a form that would gradually create as much protection for the wielder's hand as an armoured gauntlet would. 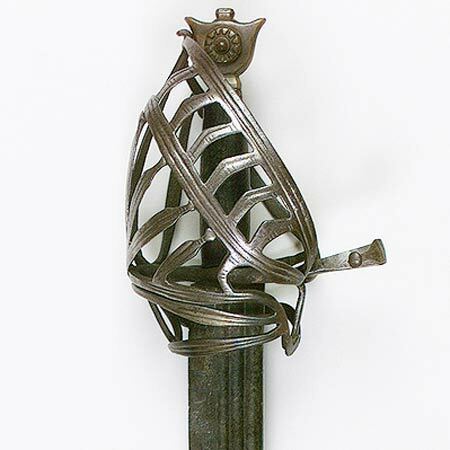 The mid-16th century through the 17th century brought a wealth of complexity to hilt forms. 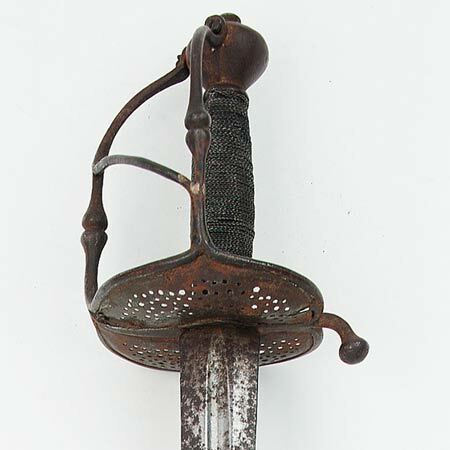 The Germans in particular were experimenting with various forms of the basket-hilt and these saw use mounted on a variety of blades of the time. 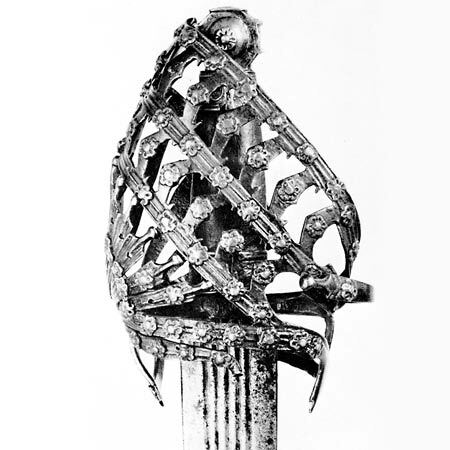 Many of these early hilt examples were crudely designed and constructed, while others were lavishly ornate. Despite this discrepancy of quality, they were all soundly designed and show a prototypical form of what eventually could be seen in the designs of 18th and 19th century military swords. 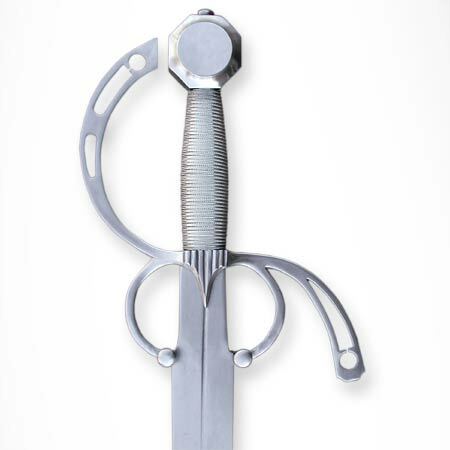 These early Germanic forms of the basket-hilt, and ones like them, can invariably be traced to being a direct ancestor to a variety of cavalry and broadsword hilts that were to develop during the centuries to follow. 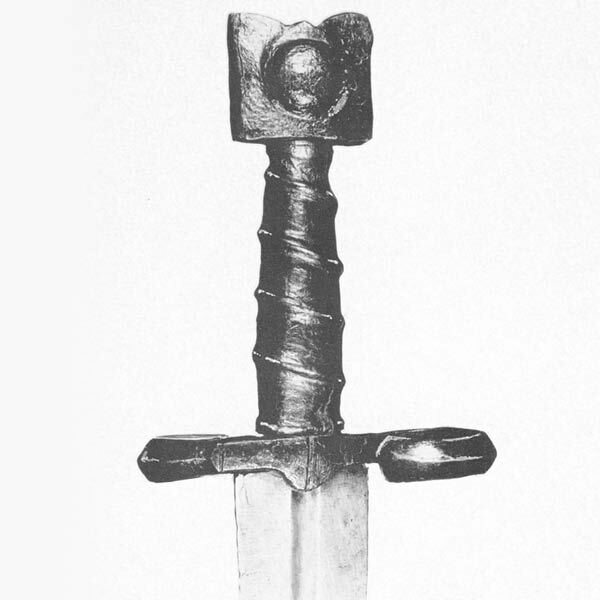 Ewart Oakeshott, the renowned authority of European arms and armour, noted that there are "five distinct types of military swords which show clear lines of development through the seventeenth century." 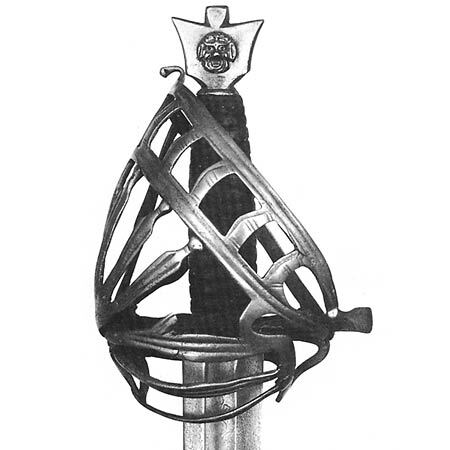 These types are defined as such: A simple hilt-form comprising of two shell-guards and a knuckle-bow to which the "Walloon Sword" belongs; the sword type and its variants referred to, seemingly indiscriminately, as the "Sinclair-hilt"; the misnamed "Mortuary Sword"; the British basket-hilt form encompassing the Scottish claidheamh mòr and its relatives; and finally, the schiavona. Despite sharing the common ancestor of the early Germanic basket-hilt, the task of tracing the development of each of these forms is monumental and quite possibly futile. 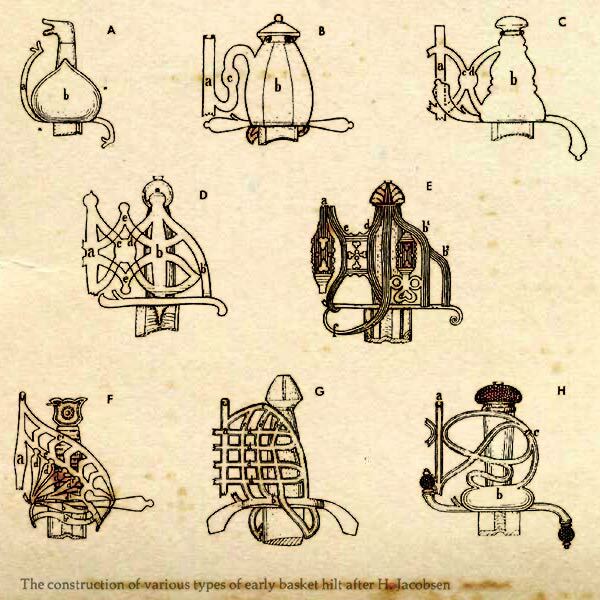 It is complicated by the fact that each form developed separately and had other unique influences that the others did not share. 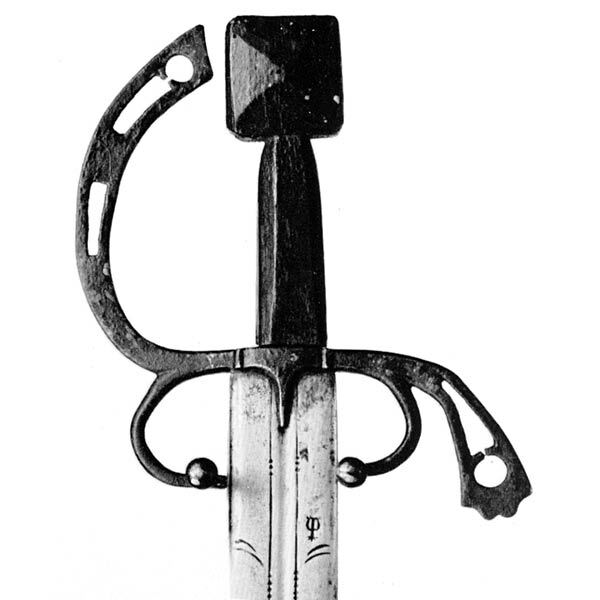 The purpose of this article is to discuss only one of the family members of military swords used in the 17th and 18th centuries: The schiavona. Because of the vast diversity of blade types found mated to this sword, we'll focus only on the hilt itself. Schiavone are found with single- and double-edged blades of varying lengths with and without fullers. There is much debate surrounding the origins and exact definition of the word schiavona (pronounced skee-ah-voh-nah). Most of the confusion has been as a result of over-zealous Victorian authors and those who paraphrase and (mis)quote them. In modern Italian, the word schiavo means "slave" and slavo means "Slav." In Venetian Italian, contemporary to the sword itself, the word is said to refer to a "Slavic woman" and may be limited to a Dalmatian. This translation is interesting in that it suggests that the naming of the weapon follows the habit of referring to a sword as a "she." Regardless, the common definition for schiavona cited in many texts specifically meaning a "hired soldier" is likely incorrect. Despite the confusion with the name itself, the schiavona can certainly be associated with soldiers recruited from the ranks of Venice's influence in the Balkans. These military men served as a fierce fighting force, using their distinct swords in Spain, as bodyguards to the Doge of Venice, and as warriors against the Ottomans. It's the tales of these Slavic soldiers that have caused them to be so tightly connected with the schiavona sword. 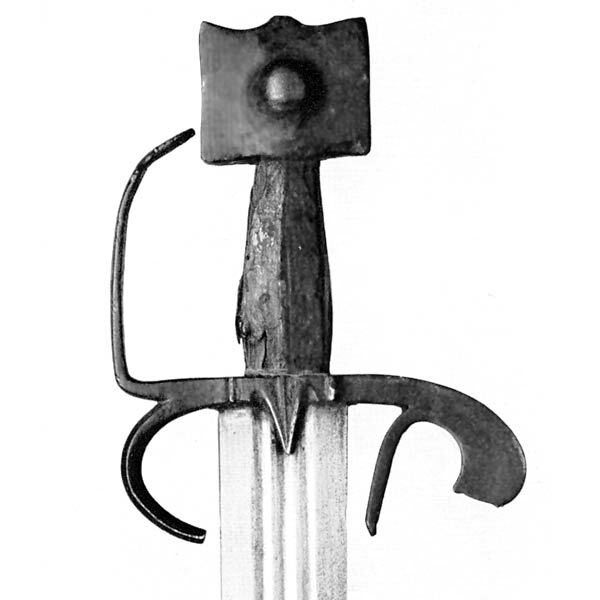 As the schiavona developed, a variety of different sword forms, cultural influences, and other factors all came into play. 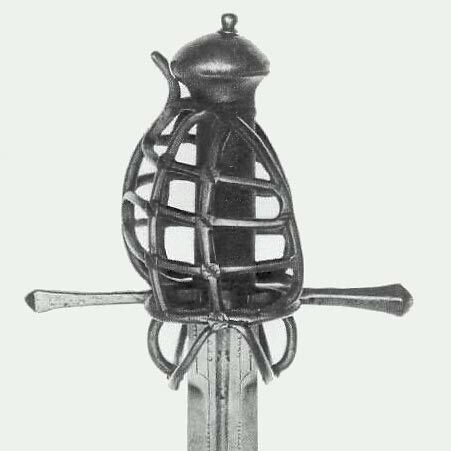 Already discussed has been the influence of the early Germanic basket-hilts, but what of the distinctive pommel seen on so many examples of schiavone? 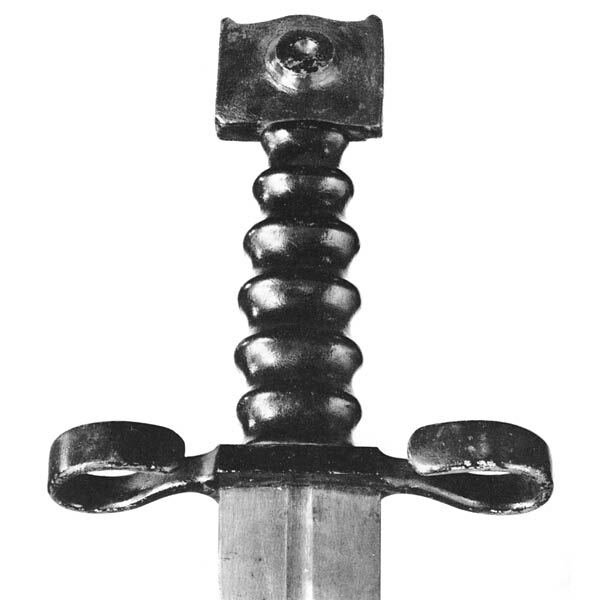 The "cat's head" pommel, called katzenkopfknauf in German, can be found on surviving examples of cross-hilted swords of the 14th century. Many of said examples can be traced into the hands of Slavonic soldiers stationed in southern Europe and in the employ of the armies of Spain and Venice. 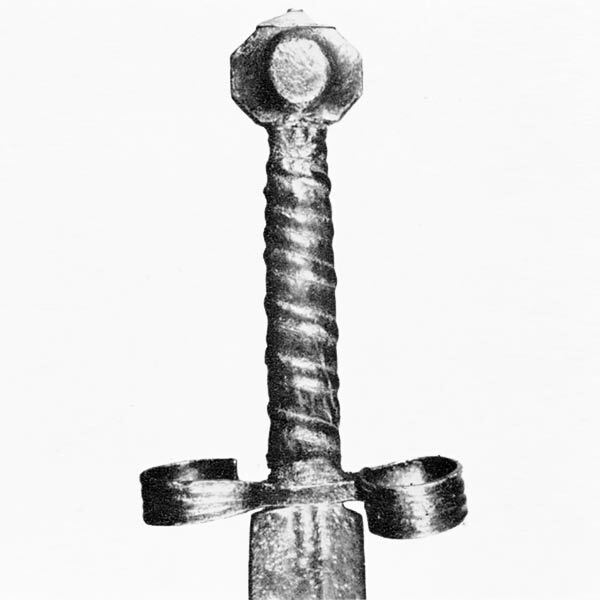 These swords have hilts with a square or rectangular pommel and feature a raised circular boss within its center and a horizontally recurved cross-guard, often so curved as to form circles. 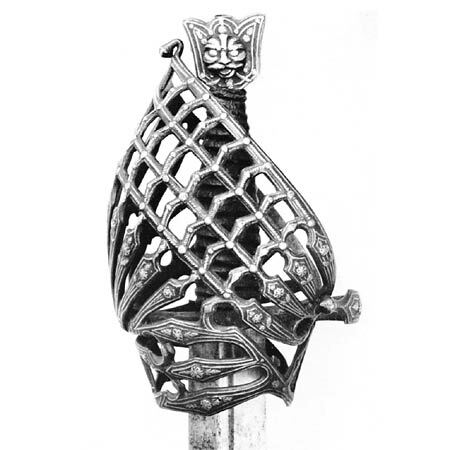 Guards of this same type can be traced to 14th and 15th century Hungarian swords, having similar pommels with less squared and more shield-like shapes. 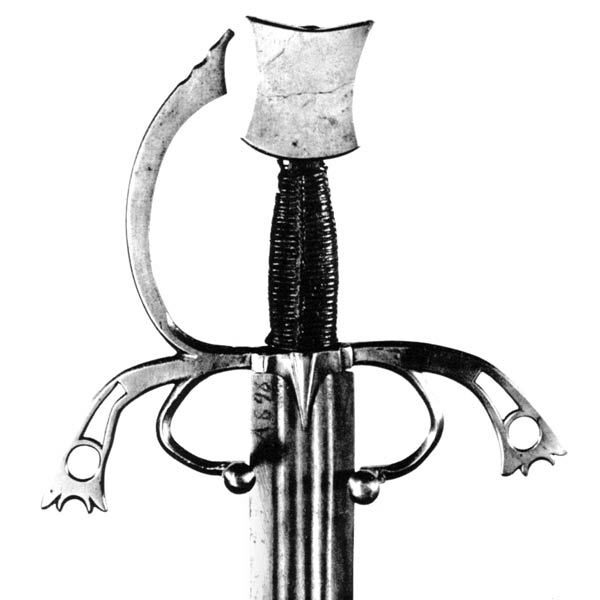 These types of swords are now often called schiavonesca, but are probably more accurately called Espada Eslavona or Spada Schiavona (meaning "Slavonic Sword"). 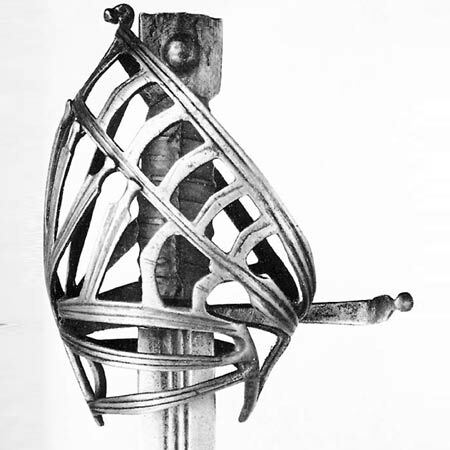 Further complicating the naming issue of the basket-hilted schiavona, Oakeshott theorizes that this may be the origin of its name altogether. The first two Examples (A and B) show the cross-hilted older Hungarian style that developed into the late-medieval type. It then further develops into Example C with the addition of a knuckle-bow and finger-rings. Example D shows the direct progression as it became more refined and took a form that remained popular throughout Italy and Spain nearly into the 17th century. 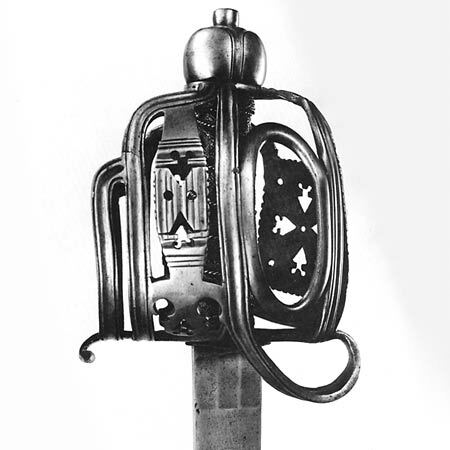 Continuing development is the hilt shown in Example E, incorporating the distinctive Spanish cut-out ornamentation of cross and knuckle-bow. 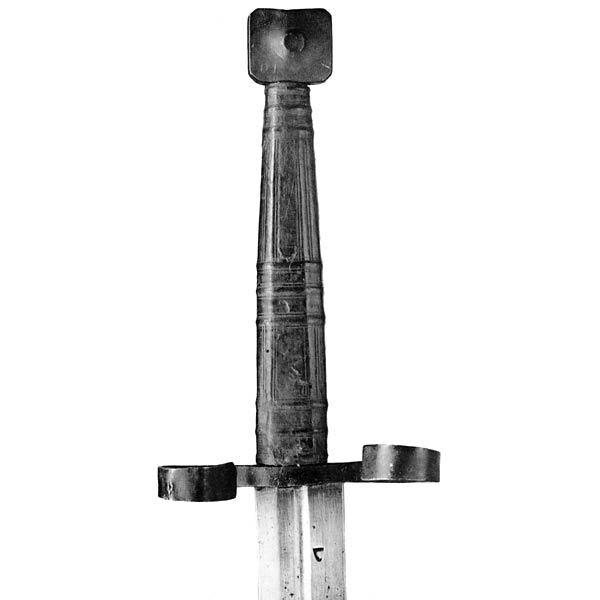 The sword shown in Example F is similar, but lacks the cut-outs of the previous example, but has the addition of a unique pommel. Example G is an unusual variation, having a recessed central boss within its typical Hungarian/Venetian square pommel. 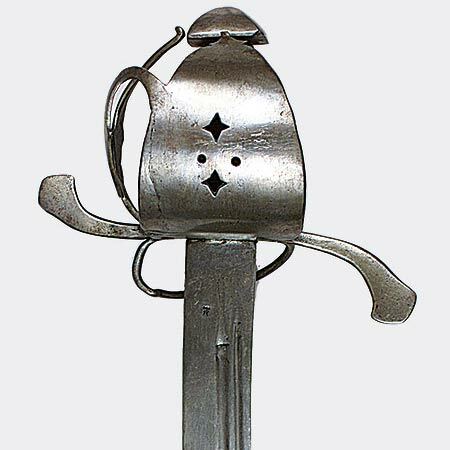 Looking again at the trident-shaped pommel in Example F, we can not only see a similarity in form to the later-period "cat's head" pommel, but most probably a developmental link between this early style and the newer schiavona. 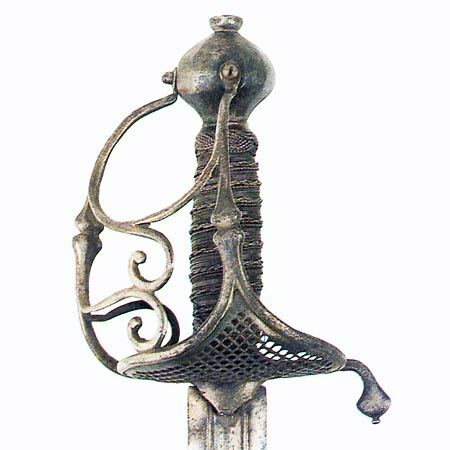 The hilt in Example H shares the distinctive trident-shaped pommel as in Example F, but is teamed up with a typically South German hilt and having a basket reminiscent of the newer schiavona baskets. 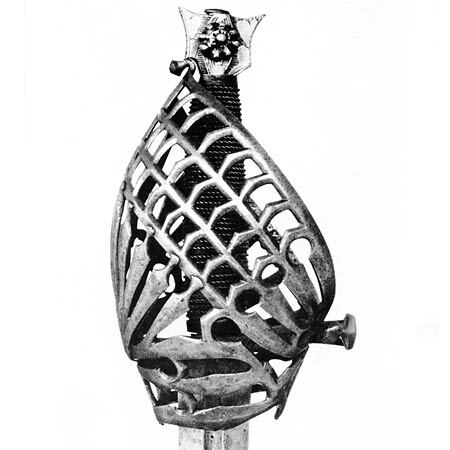 Example I shows another basket with great similarity to the newer basket styles while also having stylistic ties to the earlier Examples E and G. Even more interesting, it has a Hungarian-style square pommel and the same leaf-shaped bars covering the ricasso that many later-period schiavone have. 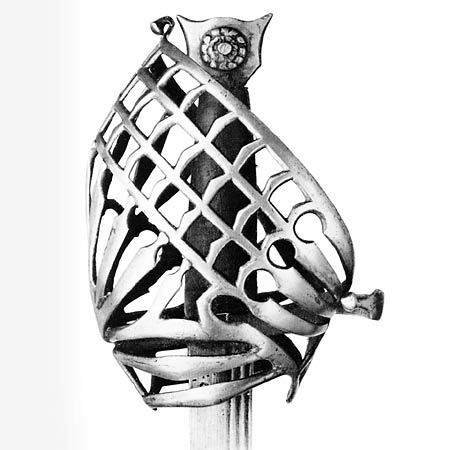 The hilt in Example J is another South German sword, circa 1570, having a similar guard to the newer basket forms. These last three hilts (H, I, and J) are monumentally important in drawing any conclusion as to the origins of the fully-developed schiavona. 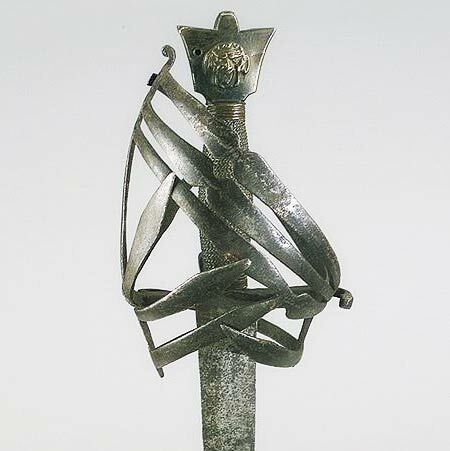 Other than the distinctive pommel found on these swords, the full development of the schiavona hilt is defined by a common design that, for the most part, incorporates a construction methodology unique in the realm of the basket-hilt. 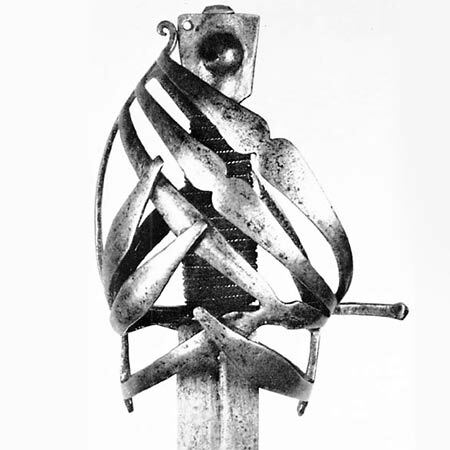 The schiavona has its principle bars all attaching at the ends of the crossbar and traveling up to the knuckle-bow in a diagonal manner, askew to the plane of the blade rather than parallel as on other basket-hilt variations. The entire basket is generally left free-floating and unattached to the pommel. In some examples, a hole is drilled into the pommel and a wire loop or ring is used to tie the pommel to the knuckle-guard. Ewart Oakeshott classified the schiavona into two main categories which he referred to as Type 1 and Type 2. In turn, Type 2 has two variations that increase in complexity which are called 2a and 2b. 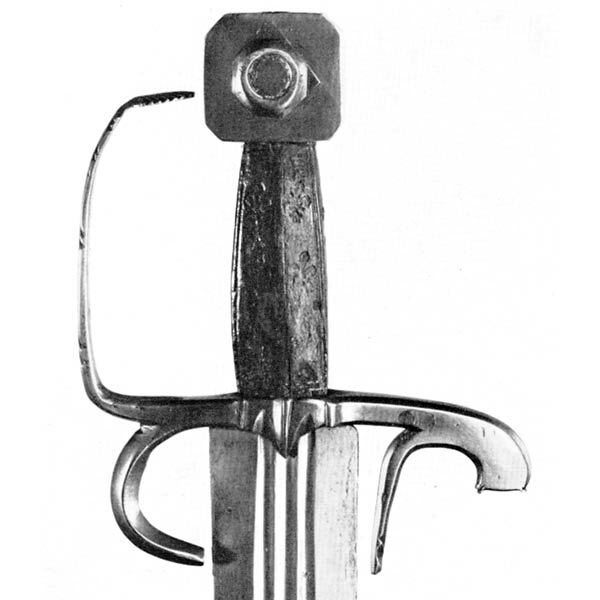 As the illustration shows, Type 1 is not only visually simpler than the others, but is so different to almost warrant it be classified as an entirely different form of hilt were it not for the shared construction methodology and distinctive "cat's head" pommel. This type is almost always rather plain and lacking ornamentation but there are exceptions. Though differences of size and the method of bending the bars can be found, very few variants of structure and form of the basket were developed. This might lead one to believe that these hilts were regimentally issued, but this cannot be confirmed. 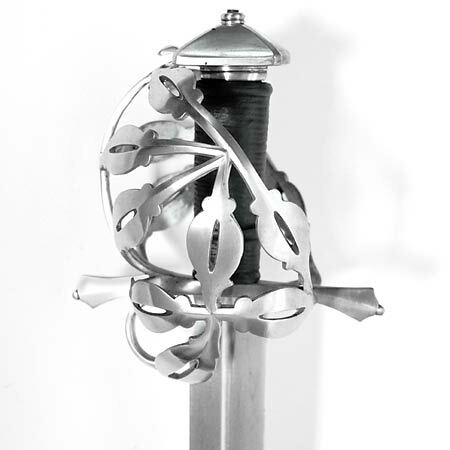 The guards on Type 1 hilts are flattened, wide, and always of a basic leaf-shape. The rear quillon is of square-section, flared at its end, and generally curved round towards the outside. At the bottom of the basket, covering the ricasso area of the blade, are two pointed bars crossing and attached at their tips. The back-guards are always rather simple and attach to form a thumb-ring. 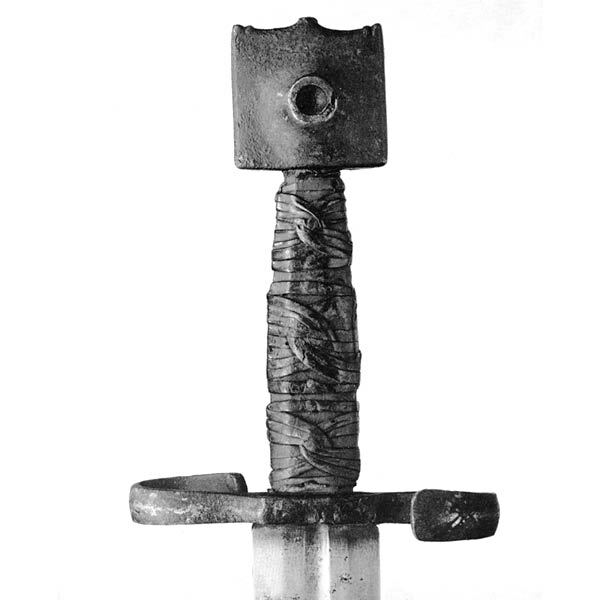 Type 1 hilts seem to have always been originally equipped with the "cat's head" pommel, though its form and material did seem to vary. The guards of the Type 2 style are more complex, consisting of bars that widen before they pinch inwards and end with a knob. The rear quillon almost always follows this same shape, bending outward. 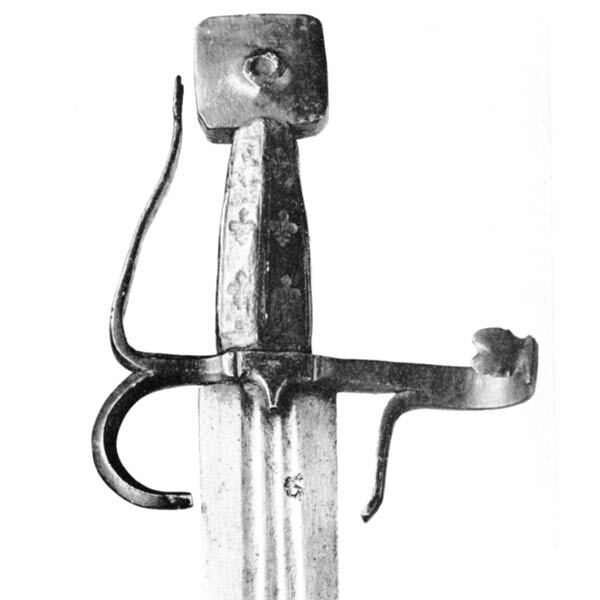 The upper loop guards of the hilt, unlike the three flattened shapes seen in Type 1, are formed from a pair of diagonal narrow bars linked together by a series of short bars at right-angles to the loops. 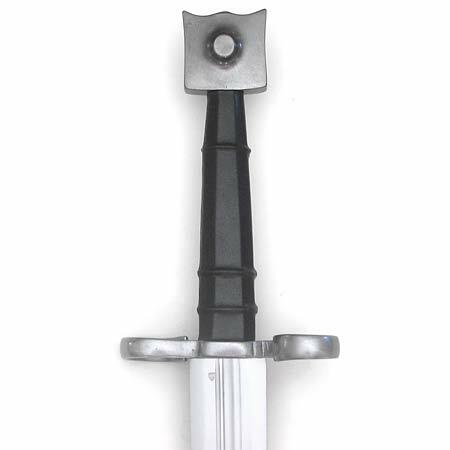 The back-side of the hilt is much more complex than Type 1, generally having a fuller structure and "sculpted" shape. Types 2a and 2b share the same general premise of the standard Type 2 hilt. The only difference is that Type 2a has three diagonal loop guards that form two rows of cut-out shapes rather than the single row. The design of Type 2b gets further detailed by adding yet another row of loop guards, forming three rows of cut-out shapes. These sub-types, like the simpler Type 1 hilt, seem to suggest a regulation pattern for they seem to have little variation in their forms. Of all four types, the hilts of Type 2 can be observed having the most design variation in structure and decoration. It is unknown which hilt type originated first and whether or not one evolved from the other. This issue is complex and theories exist supporting all possibilities. After all is said and done, it seems reasonable to conclude that the various hilt types were contemporary and quite possibly developed in separate regions. 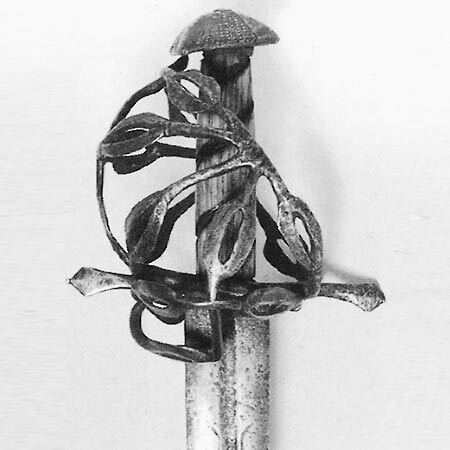 As with any sword style, the hilts of the schiavona varied in decoration and quality. Most examples are quite plain, and of these, a good amount could be accurately referred to as downright crude. 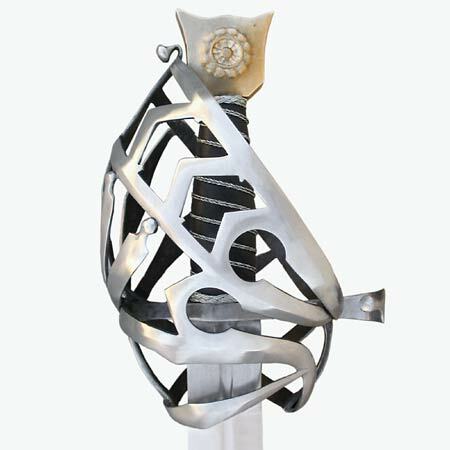 The others, however, are amongst the most elaborate of any hilt form. The study of this diversity can be observed in the pommel alone. Some examples are poorly executed hunks of metal: misshapen and lacking symmetry. Others are detailed and artistic sculptures in their own right, often featuring masks, faces, or elaborate rosette patterns. Pommels were made from iron, bronze or brass, and even solid silver. 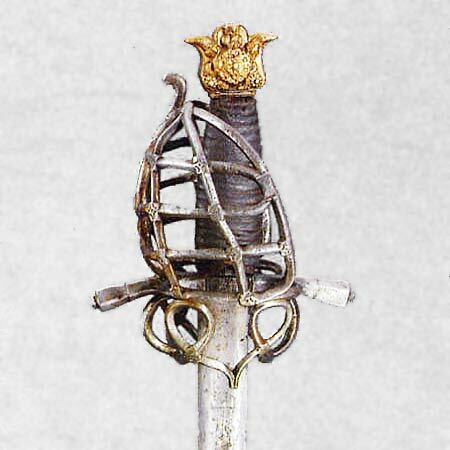 Christian Fletcher has a Venetian sidesword in his lineup that, while not a schiavona, has a hilt (but not a pommel) that looks very similar to some early prototypes of the true schiavona hilt. 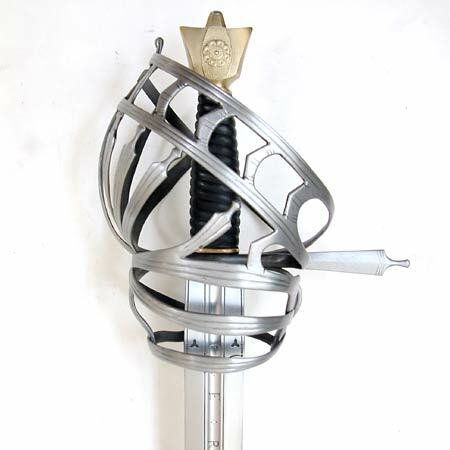 Lutel of Czech Republic also has a similar sword in their rapier section that looks like a prototypical form. 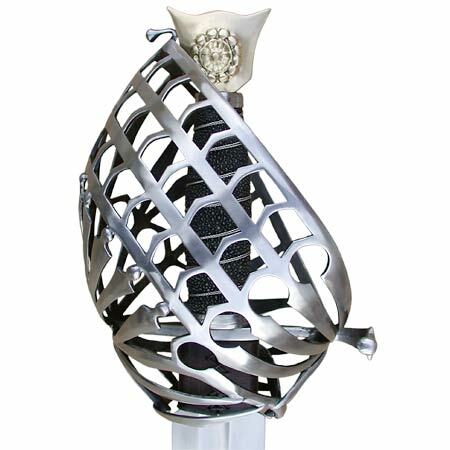 Armour Class of Scotland makes available a sword that they call a schiavona as well. 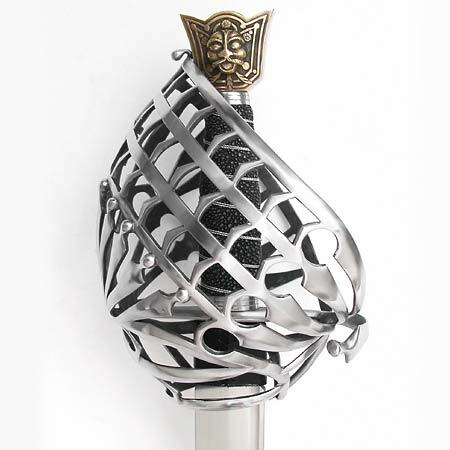 While looking quite nice and of good construction, I'm unsure if I would personally call it a fully-developed hilt, as it looks more like it was "inspired by" the schiavona or perhaps trying to replicate an early ancestor of the hilt. This being said, it sits at a good price point and from a maker with a reputation of quality products. Now that we've explored the early ancestors, we'll now take a look at the fully-developed schiavone. Museum Replicas Limited (MRL) has offered several distinct models in their lineup over the years, but most have been discontinued. These have included a Type 1 hilt style created by Del Tin, a blackened-hilt Type 1 created by Windlass Steelcrafts, and a Type 2 style. 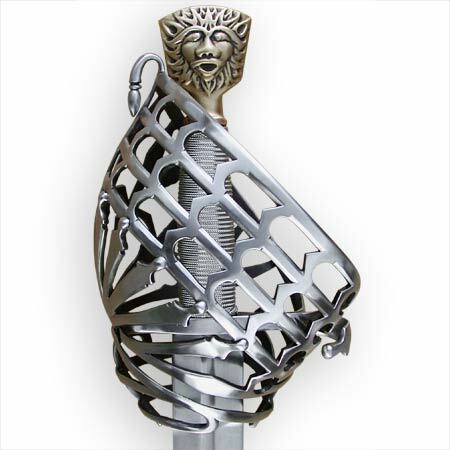 MRL has also had available a couple fantasy basket-hilted swords that were quite similar to schiavone and some of its precursors. Del Tin Armi Antiche has also been a prolific production maker, having made at least three distinct models over the years, and seems to make amongst the highest quality and best researched offerings in this range. These include the original Type 1, now discontinued and once distributed by MRL, and two different Type 2's: The DT2170 and the DT5173. Deepeeka creates both a Type 1 and a Type 2 model. 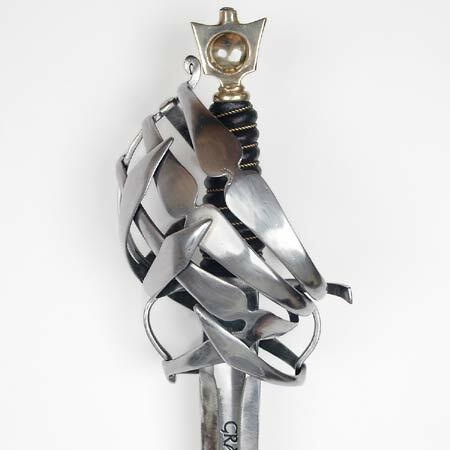 Neither have the typical "cat's head" pommel and, instead, have unusual-looking pommels that simply look out of place on these swords. Having handled both versions, I'd say that these are of the lowest quality offerings I've personally seen. It must be noted, however, that they are also at the lowest price point of any discussed here. Moving away from the production and semi-production models, one might be interested in seeing some custom offerings of which I'm aware. First and foremost is Erik Stevenson of Phoenix Metal Creations. Erik seems to have rediscovered the lost secret of making these complex hilts, as his are amongst the most accurate and beautiful pieces that I've seen. He also has the distinction of choosing some very complex and ornate originals from which to draw his inspiration. In Europe, Patrick Bárta, from TEMPL Historic Arms of the Czech Republic, created a custom Type 2 schiavona for my own collection that is superbly crafted and extremely authentic. Vladimir Cervenka offers a hand-forged Type 1 variation as a standard catalog item mounted on a narrow-tapered blade that I've also recently added to my collection. Arma Bohemia and Armoury Maral both make very good-looking examples with varying degrees of authenticity. I've never personally handled either of these and cannot attest to their quality, but the gallery photographs are quite nice. Eddie Floyd of Swordplay Alliance is responsible for creating the prototype for MRL's Type 1 hilt. He continues to take custom sword commissions. Examples of his work can be seen within his Web gallery and include a fantasy version that is very reminiscent of some South German proto-schiavone. 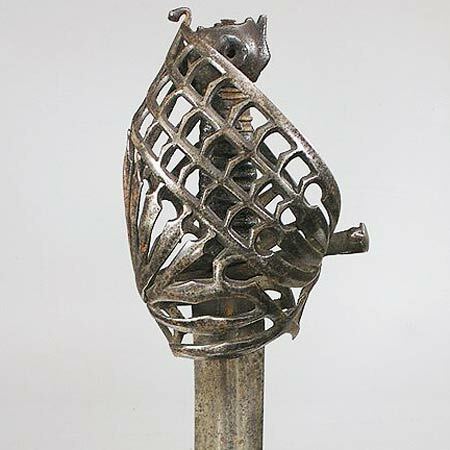 There still remains much doubt as to the specific dating of the schiavona hilt form, questions as to which hilt type developed first, and many theories about how it relates to other basket-hilts. Despite all these questions, there is no doubt as to the lure of this unique hilt form. 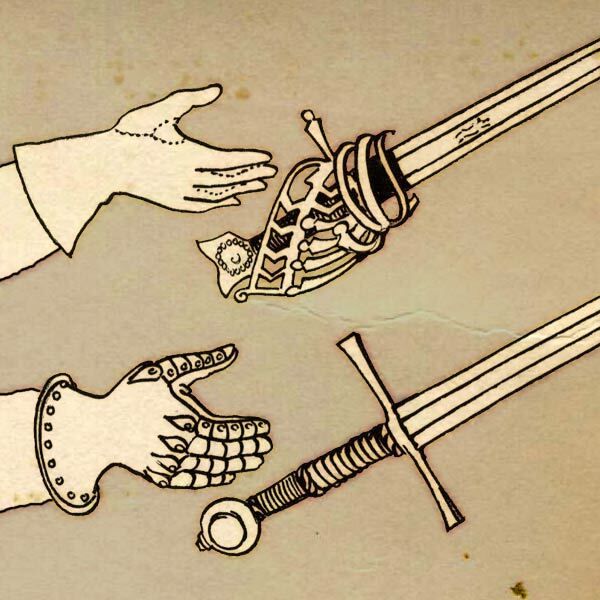 The draw has certainly made its way into the realm of historic arms collecting. 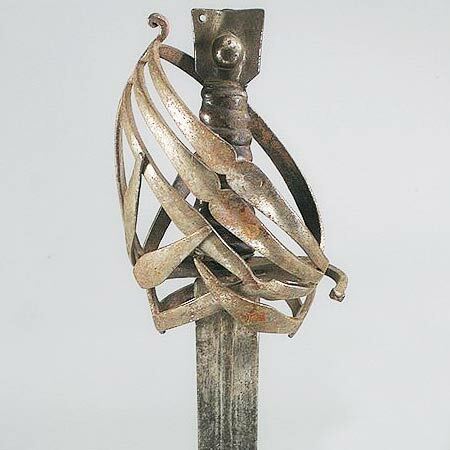 The schiavona has unique qualities when compared to other historic sword forms. 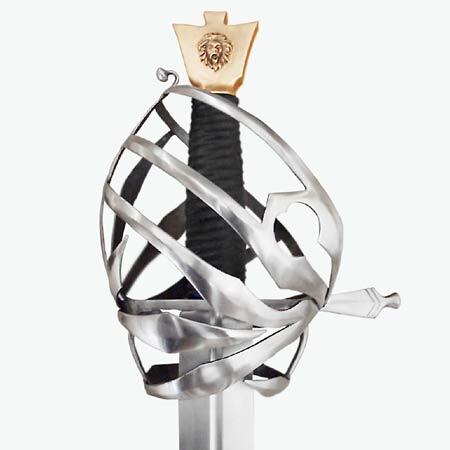 Though the complexity seems to keep it from being widely replicated in the modern market, the uniqueness has created a group of collectors hungry to own one of these swords. It often takes handling one with first-hand study to fully realize the purpose and understand the complicated construction. Very few choices are available in the reproduction market when compared to other types of weapons and finding a quality schiavona has been a somewhat difficult task. It's my hope that as more people become aware of these swords and are exposed to their artistry, our number of available options will grow. 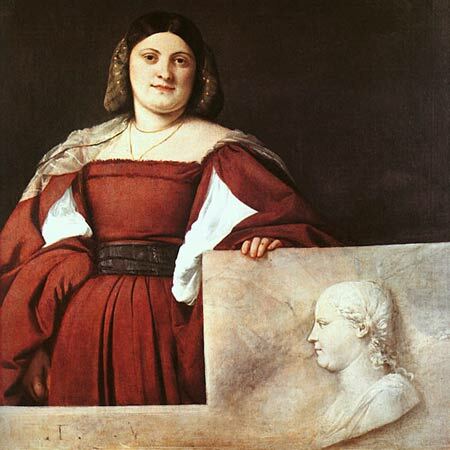 Armi Bianche Italiane, by Boccia, Lionello G. ; Coelho, Eduardo T.
The list of available reproductions contained in this article is not meant to be all-encompassing. It is, however, a good representation of what was available at the time of this article being published.